There was a problem with MSG-1's power amplifiers during the early phase of commissioning requiring an alternative means for disseminating MSG data to be found. 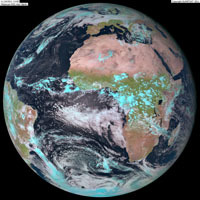 Trials of MSG data via what is now called EUMETCast (EUMETSAT's Multicast Distribution System) began at the end of April 2003. 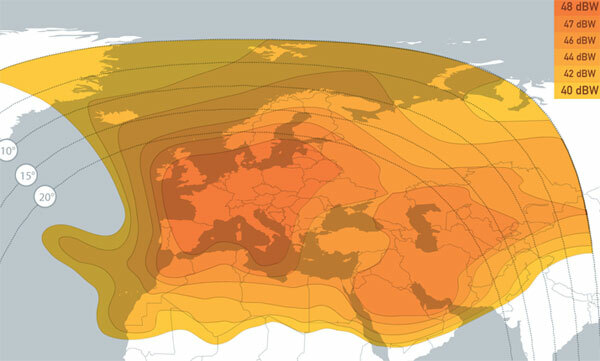 It is transmitted by EUTELSAT's 10A satellite stationed at 10�E. using the DVB-S2 format used by digital satellite TV. The trial period, designed to fully test the system infrastructure, ended in late 2003 and the service became fully operational as the primary 0� longitude service in late January 2004. Good quality satellite TV coax cable between the dish and the receiver is required, such as CT100. Care should be taken when stapling and routeing this cable as digital signals can suffer losses due to sharp bends or cable constriction. Setting up the dish to Eutelsat 10A at 10�E is not too difficult if you have a satellite TV level meter at the dish such as the TechniSat SatFinder meter. This meter is very sensitive and useful. It won’t however tell you which satellite you are pointed at though. Alternatively using an analogue satellite TV receiver and a TV at the dish speeds things up – you always ‘see’ a ‘picture’ as you adjust your dish – unlike digital TV where you have to wait for the picture to lock-up before it is displayed. If you read EUMETSAT's EUMETCast Overview document EUM TD 15 contained on the TELLICAST CD-ROM and available online: EUM TD 15 - you will see the system is based on a 2 PC set-up - there is now a vast amount of data disseminated via this service. However the majority of amateur users given modern day computer specifications are able to receive - and display - all services using a one computer set-up. To receive the EUMETCast service you will need this software tq�-TELLICAST . This handles the data stream which is sent in packets and then converted into files. 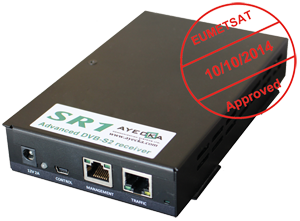 The software is supplied on a CD with an installation guide and the required USB dongle by EUMETSAT following successful registration for a cost of 100 € (EKU & Software). You will also be sent your username and password - required for setting up this software. Click for a bigger picture. This picture is still only one sixteenth the size (number of pixels) of the received image.